This month is the tenth anniversary since the historic occupation in the Visteon plant after Ford announced they were closing the plant. Below is a Socialist Party Bulletin produced at the time. 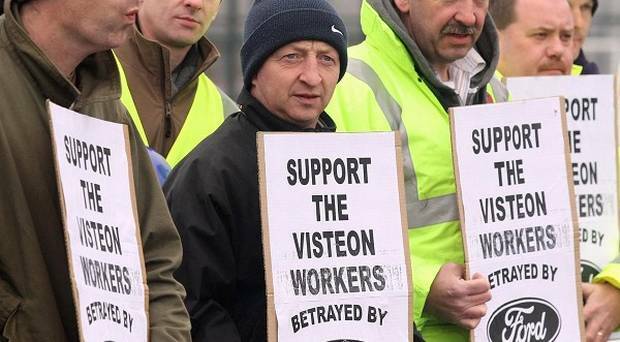 Visteon workers in Belfast have taken the lead in the fight to stop the slaughter of jobs now taking place. On Tuesday, the workforce – many of whom have worked for decades in this plant – were given six minutes notice that the factory was to be shut. Following this insult they were expected to walk away empty handed – able to claim only statutory redundancy and with their pensions frozen. Instead the workers held their ground and began an occupation of the plant. As soon as they heard the news of the stand being taken in Belfast, workers in the Basildon and Enfield plants which had also been closed began their own occupations. Enfield is still occupied while Basildon workers are protesting at the gates. 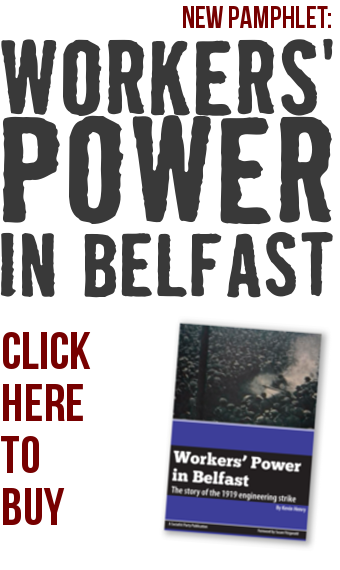 Support for the occupation in Belfast has been overwhelming. There has been a stream of workers from other factories and other unions arriving at the plant to show their solidarity. Local shopkeepers have sent in food. Cars and Lorries passing along the M1 motorway have responded to the flags and banners hung from the plant with horns honking loudly in support. The occupation is growing in strength each day. Visteon was formerly part of Ford. In 2000 it was spun off in an attempt by Ford to cut costs. At that time the workers were given a guarantee that their pay and conditions, including any redundancy terms, would mirror those of other Ford workers. Constant attempts by Visteon managers to renege on this guarantee were successfully resisted by Visteon workforce. Ford terms and conditions still applied right up to the closure. But by putting the plant into administration, Visteon and Ford have unilaterally gone back on their guarantee on redundancy entitlements. The workforce are fully justified in demanding that Ford honour the promises made in 2000 and apply the same redundancy terms that have been applied to other Ford workers in Britain. The press and some local politicians would have us believe that the Visteon closure was inevitable because the company was uneconomic and unviable. The truth is that Visteon has been deliberately run down by Ford who want to switch production to areas like South Africa where they can employ cheaper labour. Creative accounting by Ford can make Visteon appear unviable. By paying Visteon less than the real value of the components they produce Ford can transfer profits that are in reality made in Visteon to other parts of the Company. This is why Visteon workers – who are Ford workers in all but name – are fully justified in demanding that their pay, conditions, pensions and redundancy terms be the same as any other Ford workers. Ford’s and Visteon accounts should also be fully opened to trade union and public inspection so that we can get a true picture of what has been happening. The key to winning this struggle is to build the pressure on Ford. The Unite leadership should immediately issue a clear call on Ford workers to refuse to handle any components brought in to replace parts that would have been supplied by any of the Visteon plants. Unite should also prepare Ford workers to take industrial action should any worker be victimised for blacking components. Decisive action of this character could force Ford to come up with a settlement. Ford should be pressurised to retain all the Visteon jobs by reincorporating the former Visteon plants into Ford. Failing this they should be forced to honour the redundancy agreement and secure the pensions of Visteon workers. This is not just a battle over redundancy terms and pensions – it is a struggle to defend jobs. Northern Ireland is fast being turned into an industrial wasteland. Visteon workers and other worker who are now being laid off have little or no hope of finding jobs. And for the next generation the only choice on offer will be between low paid “yellow pack” jobs or else the scrapheap of the dole. If Visteon is allowed to close it is not only the building and the machinery that will be gone; skills that have been built up over decades will also be lost. This must not be allowed to happen. Rather than allow Visteon to close, the company should be immediately taken into public ownership. If Ford refuse to provide a market for the existing products the firm should be geared to alternative production. This government can spend billions baling out corrupt bankers. There is no reason why they cannot come up with the initial investment needed for research and development, and for whatever retraining and retooling is needed. Public ownership with democratic workers management is viable. The one thing that is both unviable and unthinkable is to allow any more of Northern Ireland’s industrial base to disappear. More than 1,400 manufacturing job losses have been announced in just a few days. Visteon is to go. Almost 1,000 Bombardier (Shorts) workers are to be laid off. Other companies that are shedding workers include Montupet, FG Wilson, Nortel and AVX. The impact locally of the global economic crisis is deindustrialisation on a massive scale – and the crisis has not yet run its course. Worse is to come. While the fat cats are given billions in bail outs, working class people are being asked to pay the price for this crisis of capitalism through job losses, pay cuts and a worsening of conditions. The economic strategy put forward by all the parties in the Assembly Executive is in ruins. Just a year or so ago they were telling us that the public sector here was too big. Their answer was, on the one hand, cuts in public spending and privatisation of public services, and expensive trips to the US to beg the executives of multinational companies to invest here on the other. Instead of the inward investment they promised all we have is disinvestment, job losses and factory closures. Meanwhile the Executive is still sticking to its agenda of privatising services and cutting public sector jobs. This disastrous economic strategy must be opposed. The unions must now launch a campaign to force the Assembly to take emergency action to defend jobs and services. Struggles against job losses in the public and private sector should be linked. The unions should now organise a day of action, including a massive demonstration, to defend jobs. No more job losses – firms implementing redundancies or threatening closure should be nationalised and placed under democratic workers’ management so that they are run in the interests of their workforces and of society as a whole. Introduce a programme of socially useful public works to provide jobs on trade union rates and conditions. No cuts or privatisation of public services. Guaranteed jobs, training or free education for all, including all school leavers. We can’t rely on the existing parties here or in Britain to implement these measures. Unions such as Unite and Unison should stop wasting millions of pounds of their members money propping up New Labour. This money could be used to build new parties in Northern Ireland and in Britain to represent the interests of trade union members and of working class people as a whole.